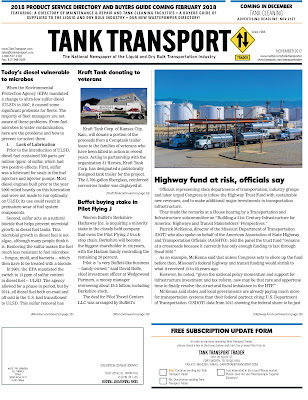 Here is an article published by our friends from Tank Transport Trader. As the colder weather is coming on us, please take the time to read this article. There are some very good points on treating and keeping your tanks clean. Bradco is a distributor of Power Service products for your tank and fuel needs. When the Environmental Protection Agency (EPA) mandated a change to ultra-low sulfur diesel (ULSD) in 2007, it caused some significant problems for fleets. The majority of fleet managers are not aware of these problems. From fuel microbes to water contamination, here are the problems and how to prevent (or solve) them. Prior to the introduction of ULSD, diesel fuel contained 500 parts per million (ppm) of sulfur, which had two positive effects. First, sulfur was a lubricant for seals in the fuel injectors and injector pumps. Most diesel engines built prior to the year 2000 relied heavily on this lubrication and were not made to run optimally on ULSD; its use could result in premature wear of fuel system components. Second, sulfur acts as a natural biocide that helps prevent microbial growth in diesel fuel tanks. This microbial growth in diesel fuel is not algae, although many people think it is. Removing the sulfur makes the fuel much less resistant to fuel microbes -- fungus, mold, and bacteria -- which then have to be treated with a biocide. In 2007, the EPA mandated the switch to 15 ppm of sulfur content in diesel fuel -- ULSD. The agency allowed for a phase-in period, but by 2014, all diesel fuel both on-road and off sold in the U.S. had transitioned to ULSD. This sulfur removal has opened the floodgates of microbial growth in diesel tanks because the natural sulfur biocide has been removed. In Florida, during Hurricane Charlie in 2004, the Federal Emergency Management Agency (FEMA) reported that 50 percent of standby generators failed. At that time, most diesel fuel contained higher sulfur content in the range of 500 to 5,000 ppm, so in many cases microbes were likely not the main cause of these failures. Instead, these failures could be traced to diesel fuel instability. As diesel fuel ages and is exposed to air, water, and other factors, its heavy-end asphaltene content will become unstable and start to drop out of the fuel. Some of these asphaltenes will be in suspension, while the rest will build up on the bottom of the storage tank, contributing to sludge. Asphaltenes in suspension can build up on the fuel filters and cause an engine failure or a reduction in revolutions per minute (RPMs). After Hurricane Charlie and the subsequent active hurricane seasons of 2004 and 2005, sales of backup generators in Florida and the Gulf Coast increased dramatically. But most individuals purchasing these generators lacked the understanding of what they needed to do to maintain the stored fuel these generators would use. Many thought they just had to fill the tank with diesel fuel and that was it. However, most backup generators are only refueled once or twice a year, so fuel preventive maintenance (PM) is a must if you don’t want unpleasant surprises when you use the equipment. Fungus and mold, along with the excretions coming from these little pests, are now the main cause of fuel-related equipment problems. Fuel problems cause about 70 percent of all diesel engine failures, and microbial growth in fuel storage tanks contributes to 90 percent of those fuel problems. The importance of staying on top of this issue is clear. A major part of this problem lies in the fact that the microbes living in diesel fuel excrete acids that damage the tank and fuel system over time. Low fuel pH is a sign of this problem. Low pH means high acid. The normal pH for diesel fuel is between 5.5 and 8, so a reading of below 5.5 is an indicator there could be a problem. The industry recognizes that the lower the pH, the higher the potential for serious corrosive damage to metal components in the system. Some systems with serious corrosion problems have had fuel pH measured as low as 2.5. There is no product on the market to raise the pH levels in diesel fuel. If you have low fuel pH, you have to address the source of the problem, which is usually microbes. Once these are under control, the fuel pH will eventually rise and stabilize through normal consumption and dilution that occurs when more fuel is added to the tank. In cases where fuel pH is extremely low, the other option is to dispose of the fuel. No viable chemical treatment will fix a low fuel pH problem. Another aspect contributing to the problem is cross contamination, where ethanol fuel ends up in diesel tanks. This is caused by switch loading in transport tankers or tank vents with common piping. A truck hauling ethanol-blend fuel one day may be hauling diesel fuel the next. There can be small amounts of ethanol left in the bottom of the tanker truck that will mix into diesel fuel. Fungus, mold and bacteria need water to grow, so it is critical to deal with water content in storage tanks as soon as it is found. Many older diesel mechanics will tell you that water in diesel tanks below the fuel pick up is not a problem. Given the changes to diesel fuel mentioned before, today it’s a different story. The rule is zero water in a diesel tank. Microbes need water to grow -- and keep in mind that a drop of water to a microbe is a lake. Water can be detected by using a water-finding paste that is placed on a stick and extended to the bottom of the tank. If the paste comes in contact with water, it will change colors. If water is detected, it needs to be pumped out. This can be a problem because most fuel distributors do not want to do it for their customers. It takes special licensing to handle, transport and dispose of this petroleum-contaminated water (PCW). Chemicals available on the market can be used to bind with the remaining water to suspend it in the fuel, which would then be burned harmlessly in the engine. These should only be used with small amounts of water. The newer Tier 4 diesel engines should have less than 200 ppm of water content because some manufacturers will void the warranty on the engine if the fuel’s water content exceeds this. Another widespread change to the nation’s diesel fuel supply is the presence of low levels of biodiesel in most diesel fuels. Most diesel contains 2 percent to 5 percent biodiesel content, no matter where you get it. Microbes love to feed off biodiesel, so any biodiesel content can make microbe problems worse. Biodiesel is also, depending on the feedstock it’s made from, a lot less stable than diesel fuel, so any biodiesel content can contribute to fuel instability and solids formation. Finally, biodiesel can make cold-weather gelling problems worse, though this isn’t much of a problem until you reach 20 percent or greater biodiesel content in the diesel fuel. The changes that have been made to diesel fuel, with the reduction of fuel sulfur to 15 ppm, require an ongoing comprehensive testing and fuel treatment program -- a fuel PM program -- in order to maintain reliable, problem-free fuel. Technicians should monitor the pH level in diesel tanks and ensure it is maintained above 5.5 (preferably in the 6 to 9 range) to prevent corrosive damage to fuel storage tanks, fuel system components, and dispensing equipment. Storage tanks should be kept as full as possible at all times to prevent condensation. It only takes a 7 degree change in air temperature to cause water-vapor condensation on the internal bare walls of a storage tank. A key element of an effective fuel PM program is testing for water every 30 days at a minimum. Deal with water as soon as it is found either by pumping or using water-removing chemicals. Remember that water is a fuel’s main enemy because microbes need water to grow. Diesel fuel stabilizer should be added in all diesel fuel that will be stored for long periods of time. Stabilizers slow the degradation of the fuel to protect its combustion quality for the longest time possible. In order for stabilizers to be fully effective, they need to be added when the fuel is fresh and in good shape. Add more stabilizer when fresh fuel is added. Most fleet managers have no idea what is happening to their stored fuel and the negative effects it could have on their backup generators, pumps, and stored fuel during emergencies. Most fleet managers also have no budget line item for fuel maintenance because they don’t know it’s necessary. Before the next emergency, fleet professionals should ensure their stored fuel is maintained and ready for use. This article appeared in Tank Transport Trader.